With Sky Level you can avoid seagulls on your building. On this page you can, among other things, read about the methodes, price, and our treatment guarantee. 1. We agree on a time for inspection where we establish the problem and its extend. 3. We agree on a time for the treatment. 4. The treatment will be executed on the agreed upon area. who gets annoyed of the noise and feces from the seagulls. Sky Level in the very front of the fight against seagulls. Ringmærkningscentralen at University of Copenhagen. for example roof constructions on apartment complexes. 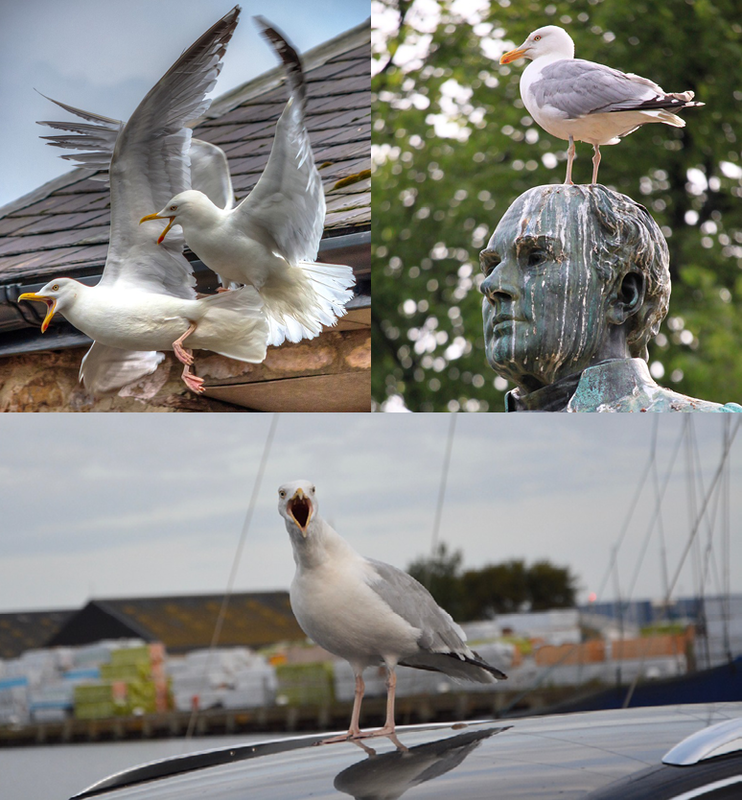 When the seagulls have laid their eggs, we will use Sky levels foods approved special mix. Approval from Naturstyrelsen is required. NOISE: When seagull eggs hatches the noise from the chicks become extra high. Therefore it is best to spray the eggs before that happens. The spay Sky level uses does not harm the birds, but prevents the eggs from hatching, so you avoid more noises and a new generation of seagulls. SCRATCHES IN THE CAR PAINT: Bird droppings is one of the things people find most troubling, when having seagulls in their neighborhood. It is not nice to look at the droppings on cars, and on the ground, and because of the acid in the droppings, it can ruin the paint on the cars that are hit with it. The price depends on the type of roof structure, the number of nests and how many square meters the roof of the building is. Prices will therefore vary, and we always recommend an inspection of the building from a consultant from Sky Level to get an accurate price. This is an example of spraying seagull eggs in Odense V.
When the nests had been located, the robot vehicle was used to spray oil on the eggs. This building is about 400 square meters with 2 stairways and had 13 nests. We must come back at least 9 times with the drone and robot vehicle from april to august, to be able to guarantee that no eggs will hatch. For this task Sky level uses a foods approved special mix. Price: 11.950 kr. ex moms. will not have any nests afterwards. very limited effect on the seagulls, because the birds gets use to the dragon, and it loses its effect completely in calm weather. It also has a doubting effect to use hunters, because it is hard to shoot enough seagulls to make a difference. and it can make to residents uncomfortable to have someone shooting near their building. 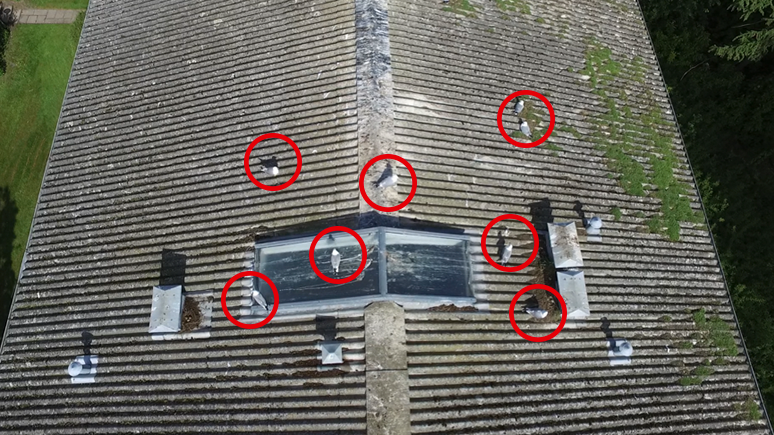 treated roofs won’t have new seagull eggs after our treatment. Here you will se seagulls still vacating the roofs even after the dragon hawks is placed. A hunter on the hunt for seagulls. It is time consuming, disrupting, and has no long term effect.